In Glendora, Calif., it's been another scorching winter day. Firefighters have a tough battle ahead, but have already managed to contain the blaze by at least 30 percent. Gov. Jerry Brown on Friday declared a drought emergency in California, where rivers and reservoirs are dangerously low after one of the driest years on record, and asked the people to cut their water use by 20 percent. He did not rule out mandatory conservation measures later. "This takes a coming together of all the people of California to deal with this serious and prolonged event of nature," the governor told reporters in San Francisco. "Hopefully it'll rain eventually. But in the meantime, we have to do our part." The declaration smooths the way for the state to seek help from the federal government, and within California it gives the state more flexibility to manage the flow of water from place to place. Brown also directed state agencies to use less water. The governor called it "perhaps the worst drought California has ever seen since records began being kept about 100 years ago." January and February are the wettest months of the year for parts of California, but this January has been mostly dry. Outside Los Angeles, a wildfire sparked on Thursday has destroyed five homes and is raging in the Angeles National Forest. Scarcity of water is threatening the state’s $45 billion agriculture business. Mountain snow, which melts and flows as water to cities and farms downstream, is about 20 percent of its normal level. One reservoir outside Sacramento has just half the water is normally has in January, according to state records reported by Reuters, and the remains of Gold Rush ghost town that was flooded to make a lake in the 1950s are visible for the first time in years. 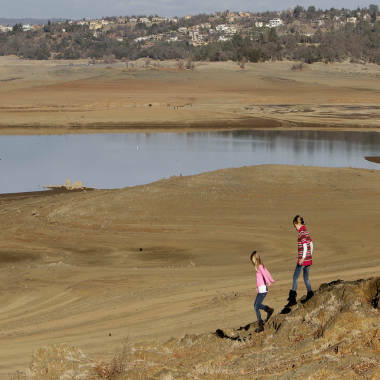 The edge of Folsom Lake in California, which is facing a historic dry spell. According to the U.S. Drought Monitor, which tracks drought for the Agriculture Department, 62 percent of California was classified as under "extreme drought" this week — by far the highest percentage since the measure was first kept in 2000. Two weeks ago, just 28 percent of California was classified that way. The problem is not just in California. Federal agriculture officials this week designated parts of 11 states as disaster areas, citing the economic strain that the lack of rain is putting on farmers. Those states are Arkansas, California, Colorado, Hawaii, Idaho, Kansas, New Mexico, Nevada, Oklahoma, Texas and Utah. In California, Brown had been under increasing pressure to make the declaration, and he had played down the significance of calling an emergency. A Republican leader in the state Assembly said the declaration was "better late than never." "All I can report to you," the governor said Friday, "is it's not raining today, and it's not likely to rain for several weeks." Authorities in Marin County, outside San Francisco, took the unusual step Thursday of pumping water out of one of two backup reservoirs — 65 million gallons, which county officials hope will be enough to last the county until the next major rainfall. At Marin Brewing Company, in Larkspur, manager Kori Stockler said the water shortage is a big topic of conversation, not to mention a business problem. "It's definitely, I think, on everyone's minds," she told NBC Bay Area. "We're a whole brewery. We brew lots of beer with water. We definitely don't want to have a shortage with that. It would definitely affect business."